Neither “sunset” nor “twilight” adequately describes the crepuscular time of day, that time when the sun has dropped below the horizon but still sends forth just enough of a glow to make your way home. In this dimming light one can just discern the path, but can not see what lives in the shadows. The only true light to be seen in this liminal twilight zone is the flashing abdomen of the firefly, Photuris lucicrescens. I spotted my first firefly this summer just a few days ago. In the ebbing light the number of people outside was inversely proportional to the number of flashing, flying insectivorous abdomens. Almost no people. Lots of fireflies. They flash near eye level, staying close to the path or hovering over the grass where they can be spotted, staying out of the dense woods or thickets. I immersed myself in the twilight several times this week. The first was in a swamp rehabilitated with hiking paths surrounded by phragmites and weeping willows, while dozens and dozens of fireflies lit up the trail like silent fireworks, no two flashes in the same location. The second time was in an urban park which hugs a tributary of the Hackensack River, with fields of yellow trefoils, butterfly weed, lavender clovers, daisies and purple asters, the petal colors all a shade darker in the low quality light. And the third time, tonight, during a run around the neighborhood, crossing through another park, the looming oaks blocking the day’s last rays of light. The bright green of the leaves faded to dark as the twilight zone drew closer to night absolute, shifting from lime green to emerald to hunter green, and finally to a deep brown-green, barely green at all. We humans have traditionally not embraced this transitional period of dusk. When kids still played outside, the specter of the coming dark could send kids racing home as the sun set. We are not totally comfortable with this dim light of twilight, unlike the fireflies and other crepuscular creatures such as skunks and deer. This time is their time, the low-quality light the time when they shine. We on the other hand struggle to make sense of what is neither day nor night, our eyes struggle to adjust, our pupils open at full bore yet not open enough. And religions that base their calendar on the sun and the moon struggle to categorize this ambiguous time as well. If the holy day is slated to begin at nightfall, an indeterminate time is of no help. If a fast from food and drink is decreed to end at nightfall, an approximate time is not helpful. When does one end and the other begin? In the Jewish religion much is discussed about twilight and dawn in painstaking attempts to delineate one day from the next, night from day and day from night. When can you begin praying? By what hour must you finish? Precisely when must all work cease for the Sabbath? But all is not knowable. There is no precise moment when the illuminated day time sky morphs into night, just as there is no exact moment when a child becomes an adult. And twilight will never resolve into nighttime with clarity. We must do the best we can to make sense of dusk and remember that at least some species flourish in the haze of the dimming light. The fireflies are one species that have adapted to use this period to search for a mate and live to illuminate another fading twilight with a final flash of light. The speed record for the fastest known time on the 2,190 mile Appalachian Trail has been broken by ultra marathoner Karl Meltzer, who chopped an impressive 10 hours off the previous record for a supported thru-hike of the trail. He went through 19 different pairs of shoes during the 45 days, 22 hours and 38 minutes on the trail, according to crew chief Eric Belz, power hiking in more than twice as many pairs of shoes as the previous record holder. Meltzer, who’s nickname is Speedgoat, wore only the Hoka One Speedgoat shoes and Drymax Speedgoat socks, two products named for himself. Crew chief Belz said on Facebook Live that the shoes were still in good condition even when the runner moved on to a new pair. Meltzer changed shoes as frequently as some professional basketball players, Belz and Meltzer joked. Actually, even at that rate the new record holder wore his shoes for about 122 miles, more than the distance run in a basketball game but less than the 300 or so miles most runners get out of their shoes. Meltzer praised his shoes for having “grip like fly paper” but he heaped the real praise on his father for making sure the ultra runner took care of his feet every night. “My feet were money all the way” Meltzer said in a Facebook Live chat hosted after reaching the Appalachian Trail terminus in Springer, Georgia. He began his journey at the northern terminus on Mt. Katahdin in Maine. Meltzer explained that he checked his feet every night and made sure his feet and lower legs were clean, even when he couldn’t shower for almost a month. “I had no blisters” Meltzer said, “Keeping your lower extremity good is really really important” he stressed during the on-line chat. But neither shoes nor socks explain Meltzer’s string of ultra marathon victories or his newest record on the AT. The man is simply fast, strong and determined- this was his third attempt at breaking this record. Speedgoat is Meltzer’s nick name for good reason and now it is the trademarked business name for his line of product endorsements. He is one of the most if not the most successful ultra marathon runner ever. Sponsored by several companies most notably Red Bull he is also closely identified with the ultra cushioned shoes made by the up and coming shoe company Hoka One One and he has the eponymous Speedgoat model named for himself. Until now the record for a supported thru hike of the AT was held by ultra marathoner and author Scott Jurek who hiked for 46 days. 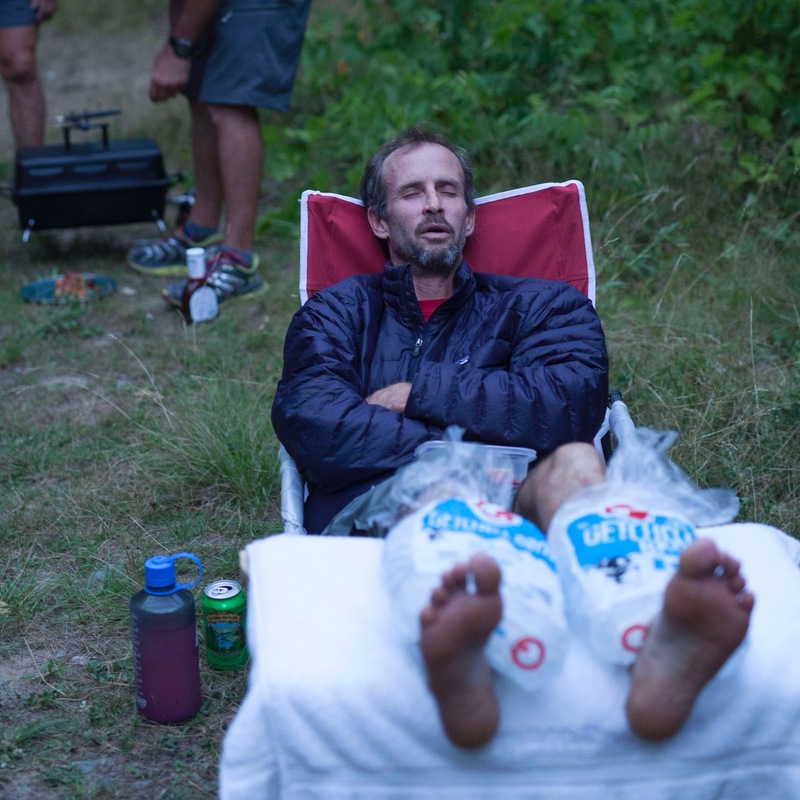 Jurek in turn bested the previous record by 3 hours set in 2011 by avid hiker, back packer, author and guide Jennifer Pharr Davis who shattered the previous record by 26 hours. Pharr Davis who hiked without major retail sponsorship wore Salomon Synapse Natural Motion boots, according to an interview that appeared in Backpacker magazine after her record. She still holds the woman’s supported record on the AT. As a long time follower of mountain climbing in general and expeditions to Mt. Everest in specific I was intrigued by the idea of being able to follow a current expedition on the mountain underway right now as I write this post via the magic of social media. And not just any old fashioned social medial like Facebook, Instagram or tumblr, but rather through the latest social medial phenom, Snapchat! Three experienced climbers with legit bona fides, Adrian Ballinger, Cory Richards (climber and expedition photographer) and Pasang Rinji Sherpa, are documenting their climb of the world’s tallest and most famous high peak. #Everestnofilter is a response to years of guided expeditions primarily for the wealthy and adventurous where the climbs are super supported by dozens of Sherpas and the climbers are assisted in their own climbing with assistance up and down the mountain and with supplemental oxygen. This expedition in contrast will have some Sherpa support but the climbers are not part of a larger guided expedition. And in distinction to most paying clients who get to the top of the 14 mountains over 8,000 meters including Everest, these climbers plan to join the ranks of the word’s most accomplished climbers and will not carry extra oxygen in tanks but will breathe on their own. This decision makes the climb into the super low oxygenated air much more difficult and dangerous. Besides the pared down nature of their approach to the mountain and the frequent posts to social media, #everestnofilter is also heralding other nouveau ethics on the mountain, fueling themselves at least in part by eating Soylent a complete nutrient vegan soybean and algae based food available as a drink or powder. The expedition, sponsored in part by Soylent, Strava, Eddie Bauer and dZi is also aiming to raise money and awareness for the Nepali people and Sherpa communities. Everest has seen much tragedy in recent years with the loss of life during last year’s 2015 earthquake that leveled so much of Nepal and previous years where climbers and Sherpas have died in avalanches, storms and from climbing accidents. Now using the latest satellite technology, Ballinger and Richards have already started sending live movie updates from base camp which they are streaming on their Snapchat feed, #everestnofilter. Their name, ‘no filter’ is apt. So much of what we see of any mountain climbing expedition is the glory of the summit fist pump and flag waving, except when people die, at which point we see see the distraught faces of grieving climbers who survived. But in this real time documentary, we truly see the experience with no filter. In fact, yesterday’s short film took us into the climbers’ tents to see first hand the cramped quarters, super insulated cold weather gear clothes, boots and crampons lying about and a 2 liter bottle filled with urine ready to be emptied after serving its duty the night before. (“pee bottles” are de rigueur on these expeditions, saving the climbers from having to exit their tents into the frigid cold during the night). To follow this expedition, which I recommend if you have even a passing interest in what the world of high altitude mountain climbing really looks like up close and personal, download Snapchat onto your phone and than search for #everestnofilter or take a picture of the expedition’s snapcode to follow this climb. If activities had an official poem like states and countries have national birds and flags and songs, than Robert Frost’s 1915 poem ‘The Road Not Taken’ could be the patron poem of the ou tdoorsman. Deep in the woods, the narrater contemplates the two paths before him, “and sorry I could not travel both” he says. But choose he must. “And I-I took the one less traveled, and that has made all the difference” concludes this poem with its two most famous lines. And to the tens of thousands of people who have read this poem 20 lines,the credo of taking the road less traveled has become an anthem of sorts, a clarion call for rugged individualism, a recipe to how we can be certain our decsions make all the difference’. In The Road Not Taken: Finding America in the poem everyone loves and almost everyone gets wrong (Penguin Press 2015), author David Orr, poetry columnist for the New York Times Book Review, a teacher at Cornell University and a graduate of Yale Law School, challenges the common interpretations of this poem. He argues in the 172 page book that Frost was not actually exhorting the reader to take the harder or hillier or more difficult path. Rather Frost was exploring what it means for people to have free will to choose. Robert Frost struggled as a writer and a poet from high school until well in his thirties after he was married and had a family. Indeed, “At thirty five he was nobody even to the people to whom he might have been a somebody”. He was publishing short stories in a chicken farmer’s publication called The Eastern Poultryman. But he had commercial success in 1912 with the publication of “A Boy’s Will”. “The Road Not Taken” followed a few years later and his success continued. He read his poem, ‘The Gift Outright’ at John F. Kennedy’s inauguration. Frost died in 1963. And according to the author David Orr, “The Road Not Taken” has appeared in more than 2000 news stories and as a subtitle in more than 400 books not written by Frost. The poem was even featured in a Super Bowl commercial. So, what is ‘The Road Not Taken’ really about? In an almost talmudic analysis Orr writes about the title of the poem, or, that is the title that is popularly, and incorrectly typed into search engines, ‘The Road Less Traveled’. The true title however,focuses on the road not taken, and is decidedly not about what the narrator did, Orr states emphatically, but about what he didn’t do. Every phrase and sentence of the poem is up for close reading by Orr as he tries to decipher this oft cited yet not clearly understood most popular of American poems. Fo example, the choice of the word “roads” instead of paths or trails. Although Frost’s traveler is alone in a forest, “which ever way he goes, he follows a course built by other people” as opposed to following some game trail or haphazard path that cuts it way through the forest.. Frost’s wayfarer defines his choices, “one path grassier than the other”, with no mention of his destination. Is he in a rush? Is he interested in scenery or is he looking for a challenge. Does his choice really make a difference? And, does he even have a choice? ‘Two roads diverged in a yellow wood, And sorry I could not travel both’ – within two lines, it feels as if we’ve arrived at the center of the dilemma intrinsic to all dilemmas: the necessity of choice itself. If we were to dream about what it means to choose, that dream would look something like “The Road Not Taken”. Nonetheless, this poem does not address critical elements of choice, Orr explains with several examples. Frost does not address the affect of this choice on others. The decision does not have anything to do with the culture of the place, a forest. It does not reflect on any moral consequences or even present the traveler with so many options, just two. The narrator can chooses in peace without the distraction of the details of daily life yet, there seems to be no chance the walker will fail to choose and simply turn around and go back. “So if all these potential dimensions of choice are missing from the poem, what are we left with? A kind of idealized or “pure” choice,” Mr. Orr proposes. And so the author concludes his thoughtful discussion of “The Road Not Taken” by focusing neither on the poet nor the poem but on the nature of the chooser. We all make choices in our lives and no one can really ever know what would have happened had we veered onto the road not taken. Do we do ourselves any justice by trying to peer back into a past that never became reality? Frost’s traveler does indeed look back at his moment of decision, with a sigh. But in a remarkable poetic irony, his thoughts turn not to the road not taken but to the ultimate choice he did indeed select, the road less traveled. Robert Frost has created a most challenging duality where one can be both “sorry I could not travel both” but assured that his choice “has made all the difference.” Something to thing about at life’s next crossroads. The ultimate trek continues for thousands and thousands of men, women, children and families. Not an adventure trek, like an American family took last year hiking the entire 2,100 mile Appalachian trail. Rather, an escape from unlivable countries, a trek for survival. Human migration has dominated the national news of late, with daily stories of despair and desperation as families flee either their war- ravished homes or their economically disheveled countries and attempt to relocate in a stable European city. And images of migrants’ failures to reach their destination have made even more of an impact. The troubling and terribly sad picture of a toddler face down, dressed in a shirt, shorts and little sneakers, washed ashore like a dead fish, lying still on a Turkish beach, dominated this past week’s pictures. The dead boy, Aylan Kurdi, was one of two brothers who drowned, along with their mother, fleeing from Syria. Migration is neither new nor novel. In fact, here in America, question many people about their families’ background and it often includes a story of immigration. Humans have been migrating from close to the beginning of human history. Anthropologists have traced human migration from Africa to the Levant, specifically the coastal plains of Israel, into Europe, Asia and the Americas. And human fossils dating back 42,000 years have been found in Australia, most likely from migrants who boated from other Pacific islands when the sailing distance was shorter than it is today. That distance was estimated to be less than 100 miles then, but has grown to more than 300 miles since sea level rose after the melting of the ice at the end of the last ice age. Migration is well-known in the animal kingdom. Birds migrate regularly; even the common American robin has the term “migratorius” as part of its scientific name. Many mammals such as wildebeests and gazelles stage visually stunning massive annual migrations. And in the insect world, the fragile monarch will travel thousands of miles to its breeding grounds. Yet nation after nation seems to become apoplectic with a large influx of unexpected human migrants. Of course, such a response is understandable, as countries need to be able to provide resources for migrants, including shelter, food, medical care and if the migrants stay, ultimately jobs and education and permanent housing. But the intensity of discomfiture with the arrival of migrants who, by the time they arrive are in a desperate state, is surprising, as if people’s desire for safety and security is unnatural. Migration is natural and in no way an aberration. It is, in fact, ancient. American Indians often shifted between highlands and lowlands depending on the seasons and the availability of food supplies; thousands of years earlier, their own ancestors crossed from Asia via the Bering Strait. What has changed in the global picture however, is not migration, but the presence of countries’ borders and the imposition of the rule of law around those borders. We have all grown up with distinct countries and therefore accept that this construct is as it should be. In fact, against the backdrop of human and modern-human existence spanning several hundred thousand years, nationality and borders are a recent phenomenon on planet earth. So how do we, as a world with countries and borders and immigration laws, deal with the natural desire of tens of thousands of people, perhaps more, who want to migrate to a safer or more prosperous land? First, I would suggest that we remember our own humble roots as descendants of immigrants, especially those who were ‘strangers in a strange land’. In fact, Prime Minister of Israel Netanyahu recently addressed the migrant crisis, since the Jewish people are no strangers to their own history of forced migration, either due to expulsion, from Spain in 1492, or due to fleeing the progroms and crematoria of the second world war. Israel has already absorbed thousands upon thousands of immigrants from the former Soviet Union, even flying to retrieve immigrants from Ethiopia. Israel, he explained, is unable to absorb a new wave of immigrants. But at least he has spoken out and acknowledged the problem. Second, we should recognize that the need or desire to migrate is not sinister but natural. Third, we should work toward a path to immigration that should be universally provided by all countries, acknowledging that life, liberty and the pursuit of happiness are not virtues bestowed upon one by merit of place of birth but are universal ideals.”Give me your tired, your poor, your huddled masses yearning to breathe free” as Emma Lazarus wrote, should not only be a slogan on the Statue of Liberty. Fourth, more countries should model the exemplary behavior of German Chancellor Angela Merkel, who is taking the world lead in the Syrian migrant crisis. Fifth, with respect to the Syrian crisis, we should question why more Arab countries are not opening their doors to accept Syrian refugees and why more world pressure is not being brought to bear to resolve the ongoing crisis in Syria that is at the root of the current crisis. We are now a global community, albeit with myriad national histories and unique identities. Our economies are interdependent. Many developed nations are now an amalgam of multiple nationalities. And while I do not advocate for the total homogenization of the global population and a borderless world, we do need to allow for occasional population shifts. They should not be a burden to any one country and all stable countries should participate in opening their doors. For if we do not work out the mechanics of this challenge now, with a world of nearly 7 billion inhabitants, the distribution of people across the globe will certainly be one of the preeminent issues facing the world in the very near future, as we grow toward the estimated 9 billion people this planet is projected to host in the not-so-distant future. “When” of course, must be now. Whatever calendar you keep, whatever holidays you celebrate, here is a wish for all to have a healthy and happy year, wherever you are around the globe. aka Micah True who lived and ran in Mexico’s Copper Canyon. He was inspired by the native Tarahumara people who lived there and ran long distances just for fun. Micah True went on to host races in the Copper Canyon to bring revenue and support to these indigenous people. He died in 2012, while running in the Gila Wilderness of New Mexico. A documentary is making its way across the festival circuit this year about this inspiring person who required little for himself all the while working to make the world better for others. The trailer has been released. Trailer | Run Free – The Story of Caballo Blanco. Off the Trail: The Anthropocene is here to stay. The term Anthropocene is starting to appear more and more frequently. The “cene” ending of the word is familiar from any number of geologic epochs such as Holocene or Pleistocene. But in the case of Anthropocene we humans are the subjects, not dinosaurs, or glaciers or seismic events of unimaginable proportion. Scientists continue to try and understand how we humans, the “anthro” in Anthropocene, are impacting our planet. Are we causing irreversible changes with development? Or over-population? Or did we start to irrevocably alter the planet when we began agriculture more than 10,000 years ago, deforesting and tilling the earth? And anthropology professor Dr. John Hawks has written about some anthropologists who wonder if we should capitalize the word at all or refer to our epoch with a little ‘a’ just to signal that this time period is currently unfolding and its full details can not yet be known. Read below for two scientists thoughts on this topic after convening an expert panel to think and write about our current geologic era and try to determine where we can go from here in understanding the “Anthropocene” and the impact we are having on what is for now, at least, our solar system’s only known habitable planet. Below is the beginning of the article which was published in theconversation.com and which I saw re-posted on earthsky.org. I encourage you to read the entire piece, written by Professors Ben A. Minteer and Stephen Pyne, both of Arizona State University. “Is the Earth now spinning through the “Age of Humans?” More than a few scientists think so. They’ve suggested, in fact, that we modify the name of the current geological epoch (the Holocene, which began roughly 12,000 years ago) to the “Anthropocene.” It’s a term first put into wide circulation by Nobel-Prize winning atmospheric chemist Paul Crutzen in an article published in Nature in 2002. And it’s stirring up a good deal of debate, not only among geologists. The idea is that we needed a new planetary marker to account for the scale of human changes to the Earth: extensive land transformation, mass extinctions, control of the nitrogen cycle, large-scale water diversion, and especially change of the atmosphere through the emission of greenhouse gases. Although naming geological epochs isn’t usually a controversial act, the Anthropocene proposal is radical because it means that what had been an environmental fixture against which people acted, the geological record, is now just another expression of the human presence. It seems to be a particularly bitter pill to swallow for nature preservationists, heirs to the American tradition led by writers, scientists and activists such as John Muir, Aldo Leopold, David Brower, Rachel Carson and Edward Abbey. That’s because some have argued the traditional focus on the goal of wilderness protection rests on a view of “pristine” nature that is simply no longer viable on a planet hurtling toward nine billion human inhabitants. For hikers, trekkers, trail runners, and armchair adventurers, Mt. Everest has to loom large as an ultimate destination. Unfortunately, over the past 20 years, so much high altitude catastrophic loss of life has occurred there. 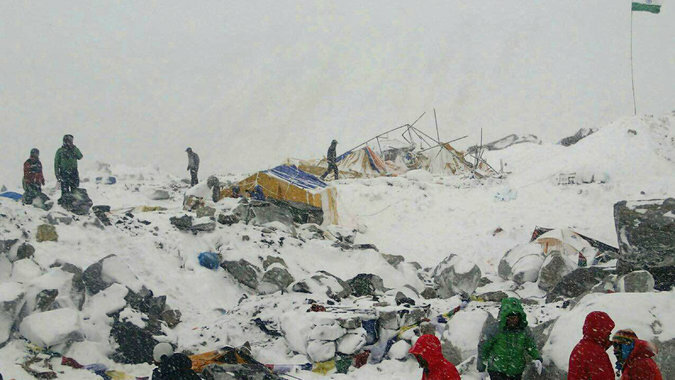 As of 10 p.m. EST on April 24, 2015, the New York Times is reporting another 17 people have perished on the mountain after an avalanche swept through base camp, killing climbers in their tents at base camp, and cutting off those camped above the avalanche beyond the Khumbu icefall section of the route. This avalanche is attributed to the magnitude 7.8 earthquake with its epicenter near Kathmandu which struck today and the subsequent aftershocks. That event has reportedly claimed well more than 1,800 lives with that number surely to be revised upwards. In a chilling coincidence, with respect to Mt. Everest, this past week marks one year since 16 Sherpas died in an avalanche in the Khumbu Icefall area between base camp and camp one on the mountain’s southeastern ridge. Writer Mark Synott posted a thoughtful piece about guided climbs on Mt. Everest on adventureblog.nationalgeographic.com just days before this most recent catastrophe and loss of human life occurred. In his piece, titled ‘Everest-a moral dilemma’, which now seems very dated, reading it through the prism of the current unfolding maelstrom of even more human suffering, Synott questions some of the brazen trends developing among guiding companies working to put more and more eager people on the summit of the world’s highest mountain, whether those paying clients are qualified high altitude climbers or not. But Synott also looks back to a simpler time, at some of the great victories on Everest when the struggle was really man vs. mountain, a time when only the most prepared and daring would deign to make that climb. In an eerie bit of foreshadowing, Synott concluded his thoughts on Everest by writing that “there is high drama to be found on the world’s highest mountain…”. He surely did not anticipate another tragic climbing season with the loss of life reported so far only paling in comparison to the loss of life, human suffering and tremendous devastation ongoing in Nepal’s capital, Kathmandu, and the surrounding region. Man versus mountain may succeed once in a while. Men versus moving tectonic plates, however, will never win. We watch helplessly from afar but hope and pray that swift relief will come to all affected, on Everest and throughout Nepal. Extra thick soled hiking and trail running shoes are being promoted this Spring and hikers will even see extra thick hiking boots heavily advertised soon, as well. Some of these shoes, referred to as “maximalist” shoes, have soles that are more than three times as thick as even standard hiking and trail running shoes. While ‘maximalist’ shoes have been around for a few years, they were mostly a niche product available from the manufacturers on line or in independent outdoor gear stores. Now, national and regional retailers like REI and Campmor are even selling this unique type of shoes. The maximalist trail shoes stand out primarily for one feature – mid-sole material almost 1.25 inches thick, often made of a proprietary mix of ethyl vinyl acetate (EVA) foam blended with rubber to create increased cushioning. , like the famous Western States 100 mile race (Karl Meltzer) and posting speed records on the Pacific Crest Trail (Heather “Anish Anderson”) and John Muir Trails (Liz Thomas). Hikers, backpackers and ultra-marathoners have embraced these re-designed shoes for three reasons. First, the generous cushioning through the mid-sole layer of the shoes provides shock absorption whether running or hiking on the trail or on the road. Second, the shoes have either minimal “drop”, (the height difference between the heel and the forefoot), or, no ‘drop’ at all. Proponents of shoes with minimal or zero “drop” claim that they promote a natural gait with a less forceful impact and allow for a more efficient functioning of the achilles tendon. 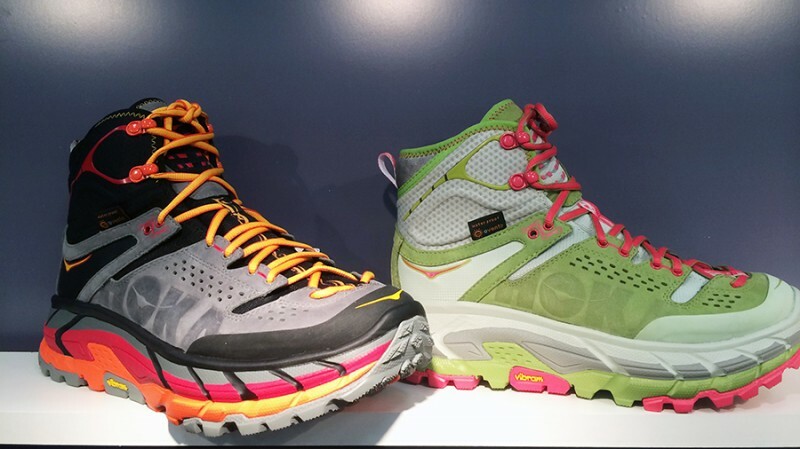 Third, the maximalist shoes, which now include mainstream brands such as Vasque, Brooks and Skechers, in addition to the two most popular brands, Hoka One One and Altra, generally have a wider and more anatomically shaped toe box. Altras have zero drop while Hoka Ones have a minimal drop. A few years ago when shoe manufacturers promoted “barefoot” running and trail shoes, like Vibram Five Fingers, they cited research and quoted biomechanics experts supporting the shoes’ benefits. And, they maintained that their shoes hearkened back to our ancient hominid roots as barefoot walkers. Now, very few ‘maximalist’ companies are citing any research backing their claims and the thick soled shoes in no way mimic human ancient foot wear or ambulation. Yet, the shoes are catching on with elite and recreational trail runners and hikers. And some weekend hikers claim that these cushioned, low drop shoes with a lot of room for their toes, helped resolve nagging problems like heel pain and shin splints. One note of caution, thogh. Theelevated platform design of these shoes may prove unstable to anyone prone to ankle sprains. And, if you are getting good results with your current hiking shoes, than, no need to switch. On the trail: the grass survives, again. The snow has melted, finally, and you can once again run, walk or hike through the grass. After months under a foot or more of snow, the grass is still green, and alive, mostly. How does grass survive the freezing cold, the darkness, buried under the snow?Humans can not survive being buried in an avalanche for more than a few minutes. Yet grass survives the cold, the weight, the desiccation. How do its cells resist rupturing, imploding and becoming a protoplasmic organic slime? How do its fragile roots maintain their grasp on a soil which has itself frozen and is no longer nurturing. This week marks the beginning of the holiday of Passover, commemorating the exodus of the Children of Israel from slavery in Egypt. The holiday has many themes, revisited each year by parents and children and grandparents and grandchildren in a performance art like meal called the ‘seder’ where the story of the exodus is retold, using food as symbolic props. But one idea often gets lost in all the preparation and the re-telling. The name of the holiday, Passover in English and ‘Pesach’ (pronounced peh-sakh) in hebrew, conveys a most basic but critical thematic idea. The name of the holiday references God’s sending an angel to visit death upon the first born males in pharonic Egypt as a punishment. God instructed the angel of death to spare the Jewish children. The name, then, focuses on a celebration of survival and an acknowledgement of God as both the taker and sustainer of life in a world filled with Divine intervention in the matters of mankind. It is by design that Passover always occurs near beginning of springtime, a period of rebirth. And the blades of grass are the first signs of that renewal. They persist through a winter that really should have killed them. But at winter’s end the grasses stand up with no flowery announcement of their arrival. Unannounced and unadorned, they unfurl themselves and reach for the warmth of the nourishing sun. The springtime holiday of Passover marks not only re-birth but also the birth of a nation that survived its own long winter of oppression, deprivation and servitude. Not every blade of grass survives the winter and neither did every member of the nation survive to leave Egypt 3,000 or so years ago. Which is why seeing the grass again in the springtime is the perfect time to truly celebrate life.